View and convert The Bat! TBB to PST format. Standalone utility for both viewing and exporting TBB Files. Inbuilt search option to search for a particular mail in the file. 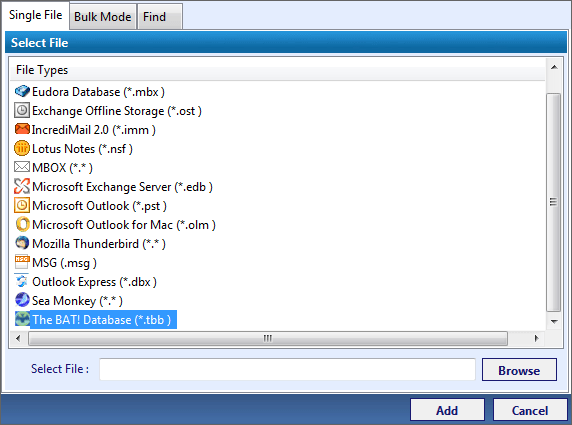 Several view modes for viewing the attributes of TBB file. Option to exclude duplicates from getting exported to PST file. Apart from TBB to Outlook PST, the Software Converts TBB files in more than seven file formats. Let’s go ahead with the Conversion of The Bat database file to Outlook PST file format. Download and Installs the TBB to PDF Conversion tool. It asks you to create the new collection and to give Title, Collection Path and Description also. In the next step, it asks you to select the TBB file format from 14 file format available there by default. Browse the file from the system. There are three option available to browse the file from the system:- 1 Single-mode, 2 Bulk Mode, 3 Find (Automatically browse selected file from the system). Subsequently, after browsing the file from the system, TBB to PST Converter Software starts uploading and scanning the file and shows the count of email file scanned. Recursive listing of a file is shown after the completion of the scan process. I have been using a paid email client for added security & support. When I start using this in beginning, it was the fantastic experience but times goes very soon. After using it for 5 years, I want to shift to email which has more realistic features and provides extended support for their products. It also supports archiving of its mailboxes also. I have 2GB of mailbox data with 500MB of attachments, which I want to convert successfully without losing any byte of information. 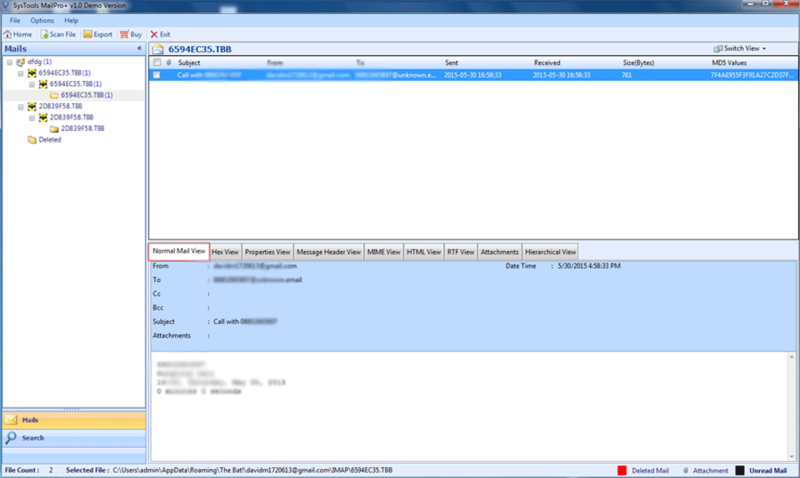 Does Conversion of Bat TBB file to Outlook PST be feasible? Is there any chances of data leakage when converting TBB Emails to PST? Can I convert bulk TBB file to Outlook PST? Does software auto-locates TBB file from local storage? What is the file size limitation of the software? Is there any option to perform the search using multiple search attributes? What type of PST file is created after conversion of TBB file? The TBB file is converted in to UNICODE type PST file. Does the software support conversion of bulk TBB files? Is installation of The Bat! necessary for Conevert TBB into PST? No, installation of The Bat! is not necessary for performing the conversion of TBB into PST file format. Can I view all the attachments embedded in the emails of TBB file? Yes, you can view all the attachments and also can export them to PST file. Finding a perfect TBB Converter tool was no less than a nightmare for me. But with TBB To PST Converter, the task was accomplished in a matter of time and with superb efficiency. As we all of know that The Bat! is not an easy email client. The Bat Email Client captures most of CPU time and RAM which causes the hang problem and other applications install on the system did not perform well. The Bat! Email client is not open source, you have to paid to use it. On the other hand, MS Outlook is the most preferred email client having largest numbers of users in the world. MS Outlook Comes in the bundle with MS office Suite, therefore you do not have to pay for application as in the case of The Bat!. To convert the data of Bat Email client you need the automated tool like TBB Files to PST Converter which can easily convert Bat TBB file to Outlook PST.